Once you’ve got that beautiful color, you certainly want to keep it vibrant, rich and dimensional weeks later, even if you spend a lot of time under the sun, go swimming and style your hair on a daily basis. Extending the life of your color is a challenge as it depends on many factors, like the kind and brand of dye you use and even what specific color you choose. The best shampoo for color-treated hair along with simple tips for your color-caring wash and conditioning routine can prolong the intensity of your color and improve the appearance and health of your hair regardless of the color you are currently wearing. We have reviewed the best color-protecting shampoos in different price ranges to help you find your ideal product to preserve that precious (and costly) color as well as the strength and beauty of your hair. Check this table for quick reference if you need to find a sulfate-free product or one that best suits your hair type and scent preferences. You can read a detailed description and recommendations for each product below. Dyed hair is more sensitive and fragile, so it needs special hair products not only to preserve color but to restore its health, which is certainly even more important. With Biolage ColorLast shampoo and conditioner, taking care of your colored strands will be a breeze and pleasure. You can buy only the shampoo, but these two complement each other so well and it turns out to be cost-efficient if you buy them together. The formula of Biolage Colorlast has been renewed, but this is the same great-working and adorably smelling shampoo and conditioner duo some have been using with love since the ’80s. Since then they have been delivering the feeling of healthier hair, along with smoothness, balanced hydration and shine. 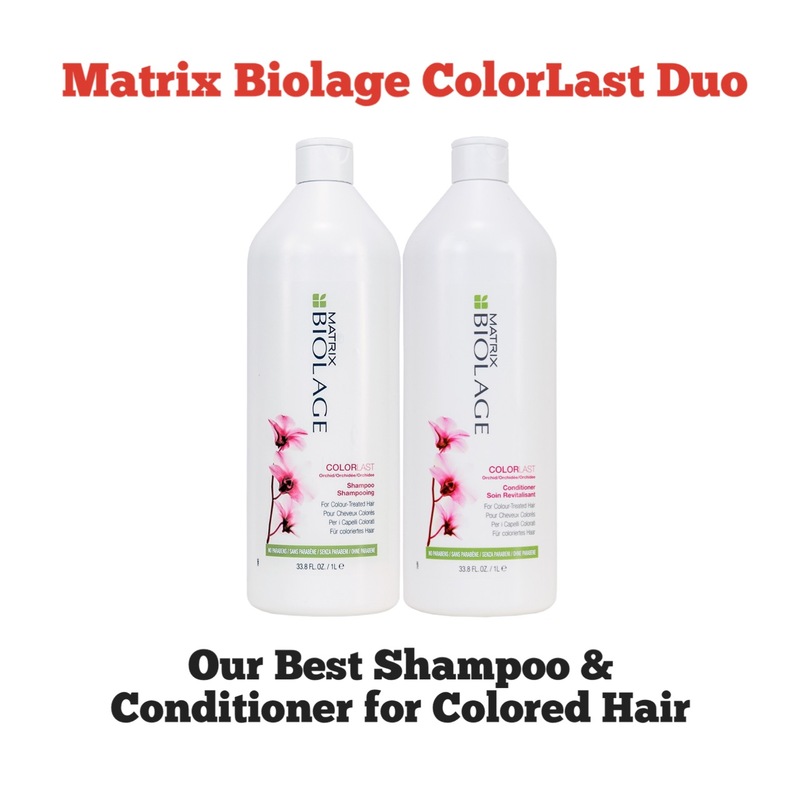 We strongly recommend Biolage ColorLast Shampoo and Conditioner as high quality and budget-friendly products for color-treated hair. These two are best suited for oily, normal and normal-to-dry dyed hair. If your hair isn’t dyed, you can still use the products as a volumizing and smoothing shampoo and conditioner with a delicate floral scent. The shampoo is low pH and free of parabens, but it contains sulfates. So, if you want a sulfate-free shampoo, keep reading; we have some worthy suggestions a little bit further down our list. Today’s custom dye jobs are unique, and you want to prolong the life of yours. Try Tigi Bed Head Colour Goddess and enjoy the vibrancy of your color for weeks. The good news is Colour Goddess will take care of your hair at different levels — color, strength, shine and smoothness. You are going to end up with strands that are a joy to look at and a pleasure to touch — what a lovely promise! And it lives up to its claim. The oil-infused formula of Colour Goddess contains keratin, pro-vitamin B5, vitamin E and natural oils to rebuild the structure of colored hair, strengthen it, nourish and restore its natural shine. While there are color-protecting shampoos for specific hair colors, like shampoos for colored red hair or shampoos for purple hair, Tigi Bed Head Colour Goddess works equally well for all kinds of colored hair and highlights, including unnatural colors like blue or green. So, no worries if you have very light blonde hair, it won’t tint it; neither will it strip your pretty green or blue locks. We do recommend it as a repairing shampoo that retains the vibrancy of color. As with any product that is enriched with natural oils, Colour Goddess may not suit you if your hair is fine and weak, but generally, it doesn’t weigh down your strands and works well for dry, normal and oily hair. Most of us are familiar with WELLA products from salon visits, but getting the same feeling of gorgeous hair at home is achievable and affordable with the WELLA Brilliance set. The word “brilliance” on the label is not an exaggeration; the shampoo contains a special ingredient for extra shine called Diamond Dust. Along with added shine, you get color protection, frizz control and strengthening. The 33.8 oz shampoo and conditioner bottle will last you 6 to 12 months depending on your hair length and how often you wash your hair. Sounds like a pretty good deal. And what’s inside the formula? The WELLA Brilliance duo has been developed to prevent color fading and protect keratin in colored, damaged hair. The products also help with hair detangling and balanced hydration, which provides smoother, stronger and healthier-looking hair. What sets the WELLA Brilliance duo apart from similar products of other brands is its compatibility with very different hair types. We know for sure it works excellently for fine color-treated hair that’s prone to being weighted down by regular shampoos, and it’s equally beneficial for thick hair that needs decent cleansing, hydration and some help in detangling. WELLA Brilliance meets both expectations and more. We recommend it as a light shampoo for oily and color-treated hair, as well as for fine hair either. But other hair types can also gain from the products. We love to take care of our hair, but we also love to change hair colors. Bleaches, toners, and hair dyes give a fast result but also cause damage, that’s why whenever it’s possible to go without salon color treatments, you should do so, and here’s one product that can help you. Blonde Go Blonder Lightening Shampoo gently lightens and brightens blonde hair and light brown hair with balayage. It brings out highlights, helps to blend in the first gray hairs in blondes and makes root growth less evident. The shampoo contains citrus fruit and chamomile extracts, the ingredients used in natural remedies for hair lightening. It lifts hair softly and gradually yet effectively to deliver fast results without bleach and dye. The usage is very easy, you simply wash your hair and let the shampoo stay in for 1–5 minutes then rinse off. The shampoo produces a conditioning effect, although it’s still best to follow it with a matching conditioner. Sheer Blonde Shampoo does exactly what it promises, and we can confidently recommend it to natural and bleached blondes who want to lift a few shades off, brighten hair and make it shiny. Use it to reveal subtle highlights in your hair as if you’ve been under the sun for a while. Do not use this particular product to remove brassy tones because for this purpose you need a purple shampoo for blonde hair. Also, note that it won’t work for brunettes in terms of lightening color, but it can still be used as a regular shampoo. Processed hair needs to be repaired and strengthened, and what better way to liven it up than with keratin products? The Keratin Complex shampoo best suits keratin-treated hair and colored hair, it extends the life of both and also strengthens your hair with keratin, repairing and replacing damaged hair cells. But even if your hair is not color- and/or keratin-treated, you can use this product to tame frizz and smooth coarse and unruly hair. The Keratin Complex shampoo is developed to make your hair stronger, softer, and more manageable, and to protect and moisturize it. However, as with any product containing keratin, it’s important not to overuse it. Too much keratin may give you the opposite results to what you expect. Your hair may become coarse and unruly or heavy and not so healthy-looking. For best results use keratin products once or twice a week and alternate with other shampoos and conditioners for color-treated hair if necessary. Well, Keratin Complex shampoo is a great product to restore your hair health, tame your stubborn locks, protect your color and prolong your keratin treatment. If you need a sulfate-free shampoo, this one is a worthy choice. However, note that it can’t be used as often as you’d like if you want to wash your hair every day. Also be ready to put some effort into lathering it. Once you’ve invested in a new, expensive hair color, try to protect it and extend its life to save on more frequent salon visits. The amino ions in Redken Color Extend Magnetics Shampoo help to retain color and generally make hair feel healthier and stronger. Just by washing your hair with a shampoo and following with a conditioner of your choice you will get soft hair with a shiny, solid color or vivid highlights. The formula of the shampoo repairs damaged hair and restores shine, gives your strands just enough moisture and doesn’t weigh them down. Keeping your overall color and highlights vibrant for longer has never been easier. To sum up, Redken Color Extend Magnetics Shampoo works well to lengthen the time between salon visits if you color your hair regularly. It’s also recommended to those with highlights to keep them fresh and shiny for weeks and weeks. Although this is not a sulfate-free shampoo, it does the job as promised and lets you enjoy your lovely-colored, great-smelling and soft-feeling hair on a daily basis. The shampoo comes with a conditioner, which is for some reason smaller in size, but it complements the shampoo well. Most shampoos are specialized either in color or in strengthening and repairing, but Joico K-pak Color Therapy seems to cover both. It preserves color and restores the health of damaged, colored hair. It’s a gentle volumizing shampoo that softly and effectively cleans your hair, makes it stronger and causes it to feel thicker, which is salvation for weak, processed hair. Together with a matching conditioner, the Joico shampoo moisturizes hair, eliminates frizz in fluffy locks, smoothes strands and prevents their tangling. The simple wash and condition routine results in soft and silky hair with added shine that looks and feels much healthier. The Joico set is recommended to all women with colored hair, yet it works best for those with stubborn and difficult hair types like coarse, curly hair or the oily roots dry ends type, and, of course, for any kind of processed hair. Your locks become more manageable feel softer after the first use, and with continuous use you definitely feel the difference in how much stronger and healthier your hair is becoming. We do cherish our hair, but sometimes we are not ready to spend a few extra bucks on an expensive shampoo. With this in mind, L’Oréal has developed a fairly good product to meet the expectations of a customer on a budget. L’Oréal Color Vibrancy Intensive Shampoo repairs and nourishes the fibers of processed hair and takes care of your color, preventing its premature fading. This gentle shampoo is formulated to produce a double effect. It protects color with the UV system and uses ceramides to repair damaged hair cells. You are supposed to use it no oftener than 4 times per week together with L’Oréal conditioner specialized in color for better results. L’Oréal Color Vibrancy Intensive Shampoo promises up to 60 days of color vibrancy. Customers claim that the brightness of color doesn’t last that long and strips little by little with every wash. The shampoo still makes hair soft and adds gloss. One of its advantages is an affordable price, but many note that it can’t compete with high-end products for color. So, let’s assume this is the case when you get what you pay for. If you want a reasonably-priced shampoo protecting color, this is a nice alternative to cheap drugstore products. We recommend following it with a matching conditioner and Post-Color Repair Mask. Whenever your hair begins to look dull and feel blah, it’s time to give it a new lease of life with a quality purifying shampoo, like the one from Pureology, and an intense hair mask for renewed healthy-looking hair. Pureology Purify Shampoo is gentle on color, but it leaves hair feeling very clean and free of buildup. The product neutralizes the action of chlorine in water, removes buildup and nourishes, giving your hair the lightness, shine, and softness it deserves. Its formula is also packed with organic leaf/flower extracts and natural oils to revitalize your strands and bring in a lovely fragrance. Pureology Purify Shampoo is recommended to those who have difficulty cleansing their hair well with regular inexpensive shampoos. It gently removes all the buildup of your hair while preserving color and making hair healthier. The product benefits difficult to manage hair types, such as fine or thick, frizzy hair or oily hair that needs frequent washes. It doesn’t contain sulfates and works as a concentrated shampoo. You may think that the bottle is too small for such a high price, but it’s going to last you longer than other shampoos, so give it a try if you are open to new products. You may opt to alternate it with other shampoos and use this one once a month to purify your hair thoroughly, but it’s also suitable for regular use. So many customers have been using Fekkai Technician Color Care Shampoo for years because it’s a great moisturizing and repairing product for colored hair. It’s gentle and copes with cleansing just fine while holding the color well. Being universally beneficial for thick, thin, and medium-texture hair, the shampoo works even in hard water, removing buildup, making your hair silky and hydrating it. The product contains grape seed oil and antioxidants to maintain the freshness and intensity of color for weeks. But it’s not just the color the shampoo targets. Your hair will feel healthier and look excellent after the 1st wash. Many begin to use Fekkai Technician Color Care Shampoo after their friends’ recommendation and that means something. You won’t recommend a bad quality product to a good friend. Numerous reviews claim it’s absolutely worth the money. We definitely recommend it as a color-protective, moisturizing and repairing shampoo for weakened hair that needs to be brought back to life after regular coloring. The shampoo is pretty expensive, but if you feel like spoiling your hair, give it a chance. All of us are different, and we have different expectations from hair care products. The Argan Oil Shampoo meets the most demanding of them as it’s a natural product with conditioning properties and a special formula based on 6 oils beneficial for hair and scalp health. You have certainly heard about the great repairing effect of argan oil for hair, and this shampoo contains 5 more nourishing oils and vitamins to treat major issues you may have with your hair, colored or not. The shampoo stands out thanks to its pretty list of ingredients that Maple Holistics can never be shy about. The lack of sulfates and parabens attracts many, but there’s much more you’ll be pleased to see on that list. Besides the essential oils extremely favorable for your hair beauty and health, the shampoo contains silk protein, phytokeratin and vitamins A B1 B2 D & E. All this good stuff and no chemicals lead to nothing but a gorgeous mane you are proud to show off. The Maple Holistics Argan Oil Shampoo is recommended to those who have allergies to regular shampoos with sulfates and harsh chemicals. It’s gentle and extremely good for dry hair and flaky scalp. At the same time, oily hair feels clean and not weighed down with this product. Use it if you deal with such issues as dandruff, hair loss, split ends and frizzy hair. This shampoo treats these conditions, providing a therapeutic action and improving the appearance of your hair after the first application. Another inexpensive shampoo on our list, Herbal Essences Color Me Happy, is a decent purifying shampoo that softens and moisturizes your hair while preventing color fade. It suits all hair types and can be used daily. The rose scent makes this product absolutely feminine, and if you happen to like it, you’ll stick to it for a while since the bottle is large and the price is so appealing. Hard to resist, indeed. The formula of Color Me Happy is free from silicones and parabens. It’s a shampoo gentle in its action yet potent in its cleansing properties. Any buildup is effectively removed and the hair is left soft and moisturized. Many prefer sulfate-free shampoos for color-treated hair. They are gentle on hair but may not purify well enough. Even if you are a sulfate-free kind of girl, you need a nice purifying shampoo once in a while to remove the buildup from your scalp and roots. Herbal Essences Color Me Happy is a good, inexpensive option. It makes your hair squeaky clean and shiny, doesn’t tangle it and cares for color. We recommend it for occasional use, but you may also find it suitable for your regular washes. ColorCare Shampoo from Pantene cleanses your hair gently yet deeply, seals in protein, moisturizes, and retains hair color between salon appointments. The shampoo contains antioxidants to preserve the shine and vibrancy of your color, encouraging it to last longer, while you also enjoy the softness and healthy look of your hair. The special Pro-V formula of the product makes hair light and soft after washing. The shampoo is ultra-moisturizing but works best with the nourishment of the matching conditioner for soft, touchable, tangle-free strands. Customers claim that Pantene Expert Pro-V Intense ColorCare Shampoo works as advertised and better than some expensive salon brands. Many remark on its light and very pleasant scent that’s hard to describe. The shampoo and conditioner set feature a nice design and reasonable price tag. If your hair and scalp are not too demanding, give it a try. If you prefer more natural and sulfate-free shampoos, you won’t be completely satisfied with this one. We wish you to succeed with finding your best color-protecting shampoo sooner rather than later. To make it easier for you we’ve listed the most frequently asked questions related to color and corresponding products, shampoos in particular. How Can You Make Your Color Last Longer? Don’t wash your hair every day. Try to wash it 2–3 times a week and use a dry shampoo in between if necessary. Color inevitably washes out with every shampoo. Get a quality shampoo and conditioner system that suits your hair type. Use lukewarm water to wash your hair and cool water to rinse off shampoo and conditioner. Cool water closes the cuticles to keep the molecules of color, nutrients and moisture safely sealed. Use permanent hair dyes as they last longer than semi-permanent. Why Does Colored Hair Need Special Care? It’s a pity to see your beautiful color getting dull over a week or two. Shampoos that are not specialized in color tend to wash out the color molecules much faster than special color-protecting shampoos. The latter also contain ingredients to restore and strengthen damaged strands, moisturize your hair, and bring it shine and softness. Do You Need A Sulfate-Free Shampoo For Color-Treated Hair? Any shampoo contains a cleansing agent necessary to remove dirt and buildup from the hair, commonly it’s a sulfate. It’s considered that sulfates strip color, while sulfate-free shampoos purify gently. However, today there’re no published scientific studies proving that sulfates cause color fade faster than other detergents that are used in sulfate-free shampoos. It’s certainly better to choose a shampoo with a low sulfate level or a sulfate-free one, to minimize the risks of premature color fade, but besides sulfates, also try to pay attention to other ingredients that should and shouldn’t be in your color-protecting shampoo. What Ingredients Should Be Avoided in Shampoos for Color-Treated Hair? Sodium lauryl sulfate. It cleanses well but strips hair of natural oils and washes out protein and natural peptides, which tells on the hair health, its beauty and growth. Sodium laureth sulfate is a gentler, less-aggressive cleanser than sodium lauryl sulfate, although both may cause allergies. Alcohol. It dries out your hair. If it’s one of the first four ingredients in the list of ingredients, don’t buy this shampoo. Formaldehyde and its releasers. These include Quaternium-15, DMDM hydantoin, imidazolidinyl urea, diazolidinyl urea, polyoxymethylene urea, sodium hydroxymethylglycinate, bromopol and glyoxal. Formaldehyde is a carcinogen; formaldehyde-releasing preservatives can cause skin irritations and lead to serious health concerns. Parabens. They break the hair cuticle, making hair weak and brittle, depriving it of shine. What Should the Best Shampoo for Colored Hair Do? One that cleanses gently without stripping your color. It should be moisturizing and contain UV filters preventing color fade in the sun. And last but not the least, it should include ingredients that repair damaged hair, such as essential oils, proteins, and panthenol. These were our suggestions on the best color safe products — shampoos and conditioners. We realize that every head of hair is unique and there’s no product that suits everyone. Anyway, you have to start somewhere. Hopefully, our review will give you some clues. Good luck and may your beautiful color last and bring you a smile every time you look in the mirror!